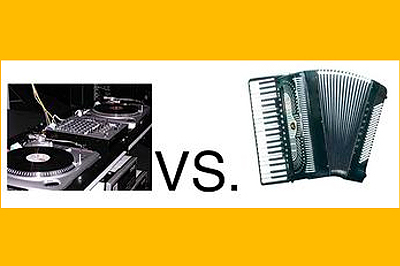 Details: Our 4th annual Contrast concert series will pit Accordion against a D.J. with music by Schimmel, Cooper, Patrick Grant, Pritsker, Jed Distler, Milica Paranosic, Joseph Pehrson and others. Join us for an after party with a performance by Erbium. At 7:00 PM we will do a procession around the neighborhood & Atlantic Terminal area. during the 8:00 PM slot with a procession in Roulette itself. Rumors! On January 25 at 7:30 PM, Con Edison Composer-in-Residence Patrick Grant presents a concert of works created and developed during his Fall 2012 residency at Turtle Bay Music School. Admission is free. 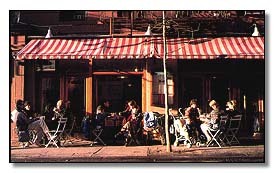 244 East 52nd Street btwn 2nd & 3rd Aves. 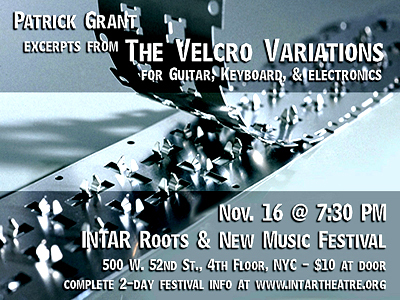 Grant performs excerpts from The Velcro Variations (2012) for electric guitar, keyboard, & electronics. Using the tools of classical compositional rigor and in-the-moment improvisation, the piece is a multi-movement journey that deconstructs and rebuilds rock and dispels the myth of the guitar hero. 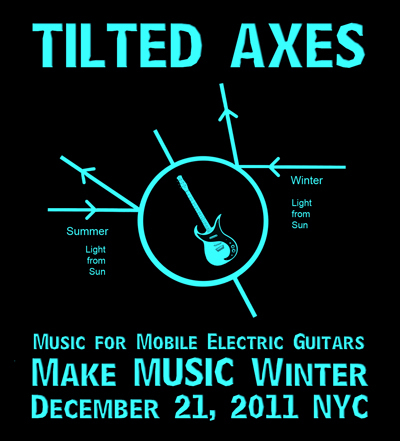 On Tilted Axes: Music for Mobile Electric Guitars, he presents material created for this year’s Make Music Winter NYC procession that was performed on the streets of Lower Manhattan on Dec. 21st. For this performance he will be joined by some of the musicians from that event and will roam the space around the audience in “…a moving, polyphonic sound cloud layered in compelling, electric rhythms.” The program includes Seven Years at Sea (Sept ans sur mer) and Breaking Butterflies Upon a Wheel. Participating musicians include Cristian Amigo, Angela Babin, Dan Cooper, Randolph Hudson III, Daniel Reyes Llinas, Cesare Papetti, & Gene Pritsker. The Con Edison Musicians’ Residency: Composition Program is funded by Consolidated Edison, Credit Suisse, the George L. Shields Foundation, the Christian A. Johnson Endeavor Foundation, AOH Foundation, the Reed Foundation, DJ McManus Foundation and individuals. This program is supported, in part, by public funds from the New York City Department of Cultural Affairs in partnership with the City Council. We also wish to extend our thanks to the Office of Council Speaker Christine C. Quinn for their support. 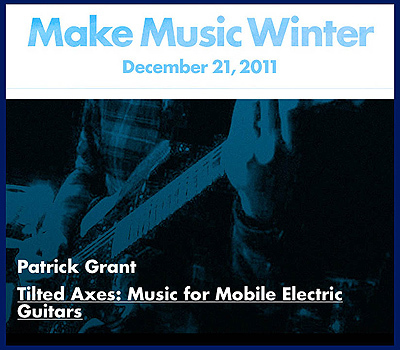 Composer and producer Patrick Grant creates and leads a parade with over a dozen electric guitarists through the East Village, ending at the newly renovated lobby of the Public Theater. The result will be a moving, polyphonic sound cloud layered in compelling, electric rhythms to honor this season’s axial tilt. 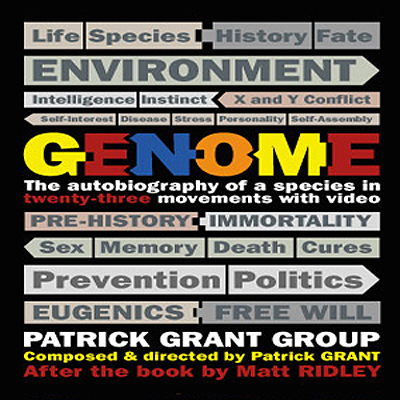 "Cures" from "Genome: The Autobiography of a Species"
arranged for clarinet, horn, trumpet, violin, piano, voice, electric guitar, electric bass, & glockenspiel. 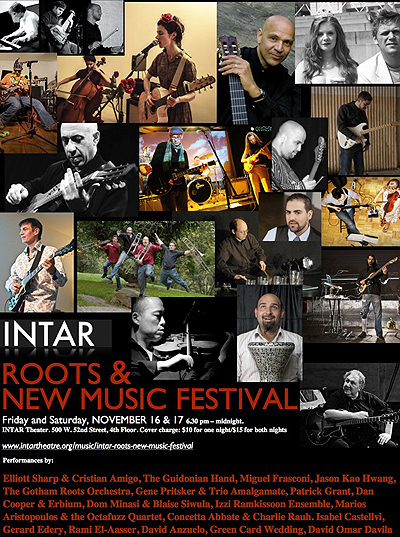 INTAR will be kicking off their Third Season (2012-2013) of concerts with their first INTAR Roots & New Music Festival on Friday and Saturday, November 16-17, 2012. Performers include guitarists Elliott Sharp and Cristian Amigo, Miguel Frasconi (glass instruments), The Guidonian Hand Trombone Ensemble, violinist/composer Jason Kao Hwang, The Izzi Ramkissoon Ensemble, guitarist/composer Patrick Grant, Marios Aristopoulos, and many others. Stay tuned for details and the final program. 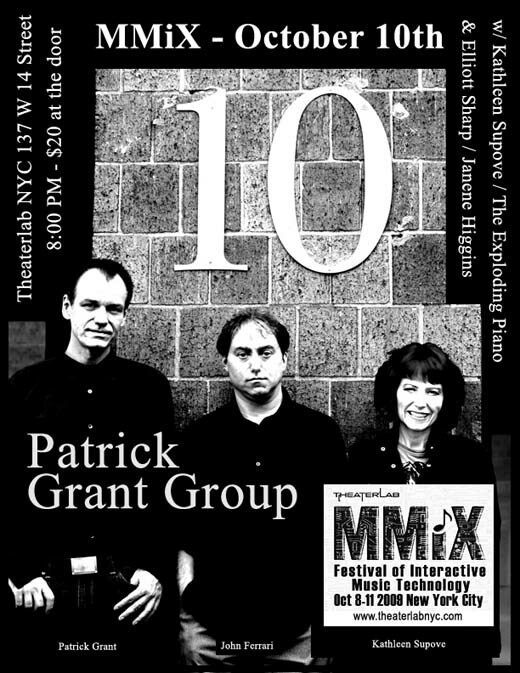 Miguel Frasconi (director, toy piano), Stephen Gosling, Patrick Grant, Brian McCrokle, John Morton, Shoko Nagai, Paul Pinto, Kathleen Supové (toy pianos). Many toy pianos, mostly from Frasconi’s own collection, play John Cage’s Cheap Imitation (1969) in unison. 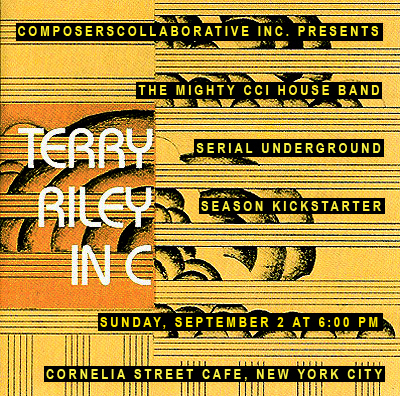 ComposersCollaborative Inc. presents The Mighty CCi House Band in Terry Riley's minimalist manifesto " In C" to launch and help underwrite the 2012/2013 Serial Underground season. Featured performers include Demetrius Spaneas (flute, clarinet, saxophones), Melissa Elledge (accordion), Gene Pristker (electric guitar), Rex Benincasa (percussion), Alexandra Honigsberg (viola), Peri Mauer (cello), Patrick Grant (NST acoustic guitar) and Jed Distler (piano). There'll be surprise guests and some surprising music! On August 30 at 7 PM in NYC: The new chamber music syndicate TYPICAL MUSIC (Todd Reynolds, Ashley Bathgate, & Vicky Chow) will be performing the musical framework I created for the Nouveau Classical Project's "In & Around C" interactive installation at Gallery OneTwentyEight on the Lower East Side. For their performance they will be joined by percussionist Owen Weaver. In & Around C by artist Mad Mohre is a participatory music and art installation presented by the Nouveau Classical Project. 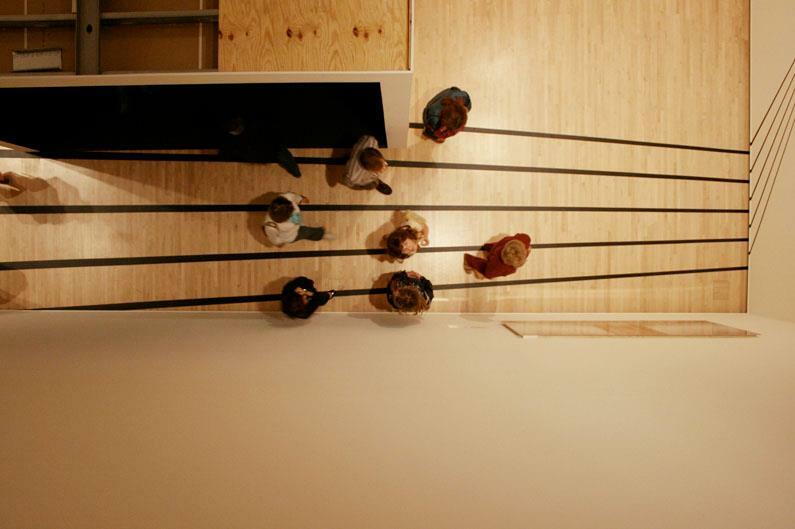 Visitors act as 'notes' that musicians play. This project is made possible by the Open Meadows Foundation, the Puffin Foundation, and the Lower Manhattan Cultural Council's Manhattan Community Arts Fund, Kickstarter. 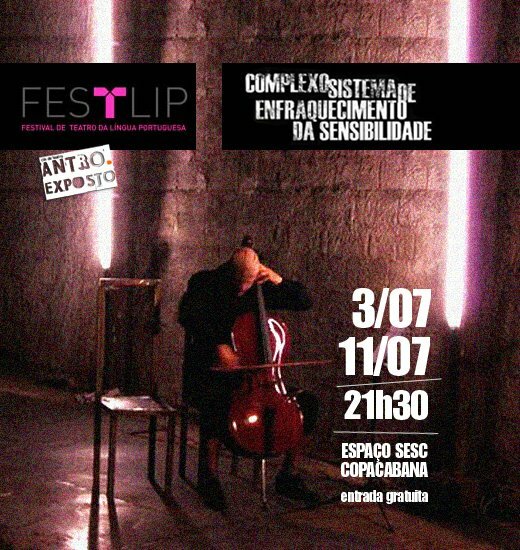 A festival that celebrates the historical interaction between the genres of classical Experimental Music and Progressive Rock since their beginning and into the 21st century. 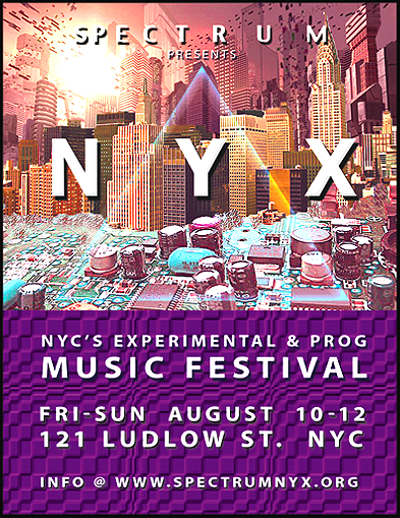 Spectrum, a recently-opened new-music performance venue in NYC's Lower East Side, presents the NYX Festival: Three days of music where Experimentalism and Prog Rock merge. 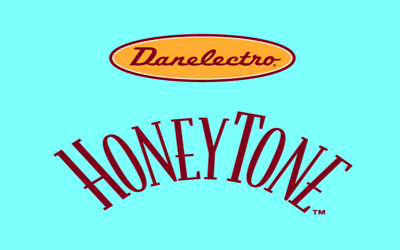 Since the last century, these two genres have shared a number of key features: the free use of emerging technologies by way of synthesizers & electronics, ambitious musical structures, asymmetric time signatures and, notably, virtuosic performance involving "traditionally-amplified" electric guitars and their kin as well as “traditionally-acoustic” instruments such as piano. 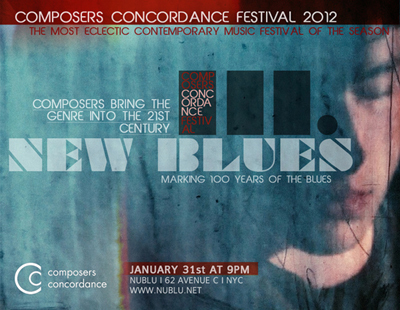 The NYX Festival has a line-up of highly-talented and exciting musicians from NYC and elsewhere. This will be an enjoyable, envelope-expanding experience for participants, both audience and performers alike. 2:00 PM: ensemble et al. The NYX Festival of Experimental and Prog Music is a three-day celebration of the interplay of classical (“traditionally acoustic”) and rock (traditionally amplified”) music. The festival brings under one roof virtuoso performers from both fields, many of the being active in both as classical and rock musicians. NYX is taking place at Spectrum on the Lower East Side of Manhattan, and is sponsored by the New Spectrum Foundation. The festival’s Co-Directors are composer/performer Patrick Grant and biotechnology entrepreneur Glenn Cornett. 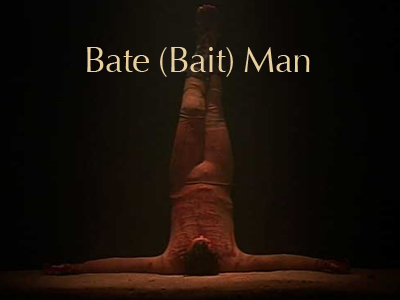 In a state of constant alert, pressured not knowing by what or by whom, Bait Man builds a deep and subtle analysis of contemporary man, with his fears, hopes and ambitions. A dangerous game is presented, creating a friction between reality and the imaginary. The world in ideological collapse, at the abyss, is the material of which Bait Man uses to play with humor and tension, causing a reflection where humanity walks by. 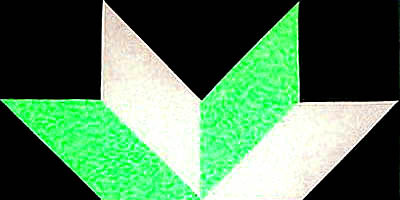 A mysterious puzzle is presented with vigor, engaging all in a discrete web of information. The spectator is invited to participate in this puzzle game, where every action involves all the senses. 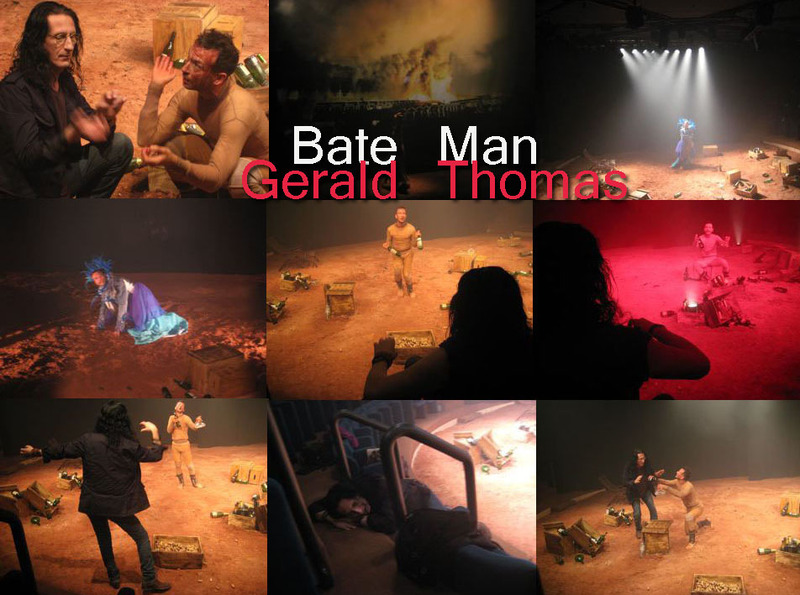 Gerald Thomas (Rio de Janeiro), director and playwright, known for his bold aesthetic and his collaborations with Samuel Beckett and Heiner Müller, explores in "Bait Man" their language and scenic places involving all in the center of the relationship between the oppressor and the overwhelmed, creating a work where the actor is the main joint element of this puzzle game. The meeting of two generations of creators, Gerald Thomas and Marcelo Olinto, developing copyright works within their own companies, is an invitation to challenge, with no safety net. 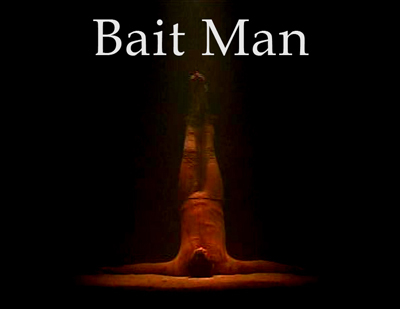 Gerald Thomas wrote and directed "Bait Man" by creating a particular work, where the actor is the main joint element of this game. 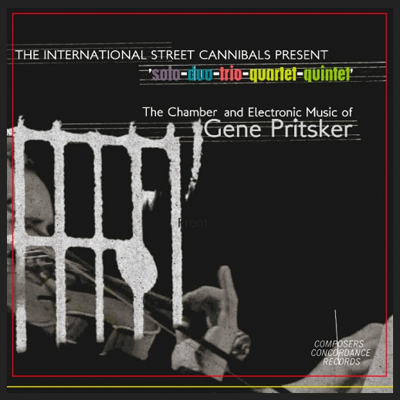 composition for one piano eight pianists by Gene Pritsker. On May 14th, The Flea Theater will once again open its doors to the most skilled and inventive composers from around the world. For two weeks, 27 of these maestros will unite in welcoming you to their playground to experience first-hand new and experimental contemporary alternative classical music performances that take place at The Flea’s FREE spring festival: Music With A View 2012. Each evening of performance is followed by an open discussion between the composers and audience, moderated by a leader in the music scene. This year’s line up include Julia Wolfe , Tania Léon, Judd Greenstein, David Soldier, Eleonore Sandresky, Patrick Grant, Ransom Wilson, Daniel Felsenfeld, Randall Woolf, and Pamela Z.
Kathleen Supové, who’s been the festival’s curator since its inception six years ago, likes to think of these luminaries as guides to intimate conversations on music and composition rarely revealed to an attending public. Music With A View 2012’s performing artists include Howie Kenty, Ruben Naeff, Vivian Fung, Judith St. Croix, Sideband, Doron Sadja, Anne Goldberg, Gilda Lyons, Jeremiah Lockwood, Svjetlana Bukvich, Molly Joyce, Jesse Krakow, Lynn Bechtold, D.J. Sparr, Jacob Cooper, Christopher Cresswell, Yoav Shemesh, Nomi Epstein, Jeremy Gill, Rodney Lister, Danielle Schwob, Michael Lytle, John Supko, Fay Wang, Florent Ghys, Joo Won Park, and Robert Honstein. Held at New York City’s historic Bohemian National Hall, this event is brought to you by Milica Paranosic, Keve Wilson, and Lynn Bechtold. The Bohemian National Hall, a venerable hub of New York’s Czech and Slavic culture since the 19th century, sets the tone for the evening. A special award will be created by NYC artist Cecilia Mandrile. Composer Gloria Coates, Co-Founder of Sing for Hope Camille Zamora, Micalea Ferreira of ARTErra - residências rurais artísticas, ABC news producer Christine Romo, Lara Land of Land Yoga, celebrated photographer Theresa Ortolani, award winning author and founder of the Storylines Project, Neela Vaswani, Anja Wood, co-founder of The Lelt Foundation, and many others. Conceived as a flowing voyage through times and Bohemian aesthetics, this concert will present music of past and present performed by New York's finest chamber musicians. Lynn Bechtold, Peter Breiner, Dan Cooper, Antonin Dvorak, Lady Gaga, Patrick Grant, Vitezslava Kapralova, Alvin Lucier, Alma Mahler, Milica Paranosic, Astor Piazzolla, Gene Pritsker, and Keve Wilson. 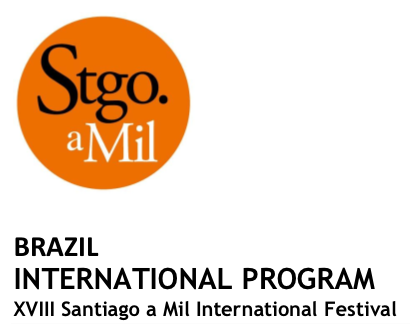 Three compositions will receive their world premiers: Milica Paranosic's "New Bohemian Suite", Gene Pritsker's "Ladies First Tango" and a new piece by Peter Breiner. Please join us for mingling and food sponsored by Balls Vodka, Trader Joe's, Kafana, Pain D'Avignon, Orwashers Bakery and Chez Jacqueline. The women of Ladies First will wear jewelry by Sequin Jewelry and scarves by Elizabeth Gillett. Marcelo Olinto, one of the founders of the Cia. dos Atores, will be seen here under the direction of the legendary Gerald Thomas to carry the torn and heartbreaking tale of a man who wants an end to the disasters that are befalling his body. "I'm hurt .. I'm hurt," he whispers, screams, anguished in the opening scenes. (The piece's) lighting and the music by Patrick Grant help to give weight and energy to a piece both intense and disturbing." Choreographers Todd Eckert and Nol Simonse return to Dance Mission Theater for the fifth anniversary of their popular Shared Space series. Through physical and theatrical metaphor, these artists consistently create lively dance concerts with broad audience appeal, featuring some of the Bay Area's finest performers. Shared Space 5 will feature three world premieres (one with original music by Patrick Grant) and as well as Simonse's critically acclaimed Etudes in Detention. Premiere: "Seven Years at Sea (Sept ans sur mer)"
Premiere: "Breaking Butterflies Upon a Wheel"
I speak with Jon Pareles, chief pop music critic for the NY Times, about the History of Audio Effects in Pop Music over the last 60 years in a segment hosted by Kurt Andersen and produced by Jocelyn Gonzales. Locally, it airs in New York City on Saturdays at 4 PM on WNYC 93.9 FM. National times for the week will vary on PRI's affiliates. Here's a link where it's available as a stream or as a podcast. Check it out if you can. Thx. Mozart's Request for a Raise"
NYC's quintessential multi-genre ensemble, The International Street Cannibals, perform a concert at The Austrian Cultural Forum whose thematic core is Mozart, his influences, and the stylistic and structural ramifications of his work. John Clark, & Milica Paranosic are on the program. 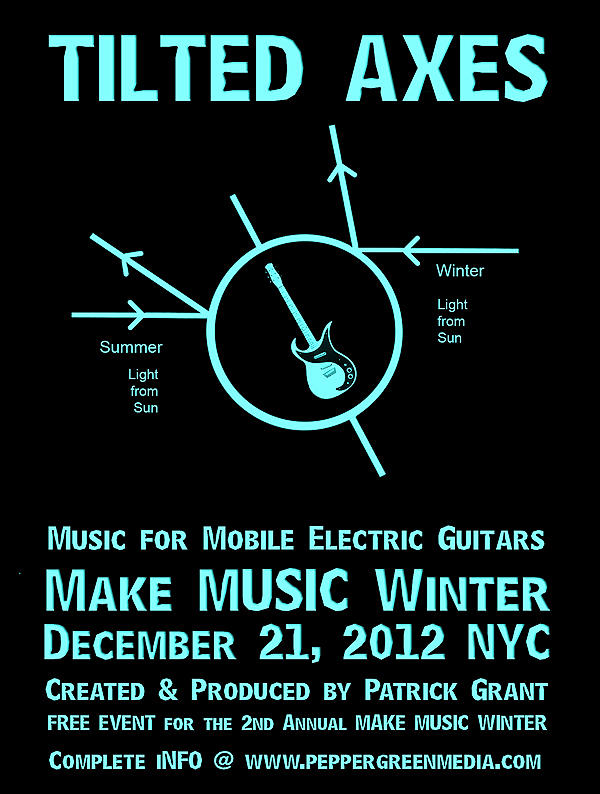 For the 1st annual Make Music Winter (info at bottom), notorious composer and producer Patrick Grant creates and leads a "precession" of over a dozen electric guitarists playing through Danelectro Honeytone mini-amps through the East Village, around Union Square, and back. 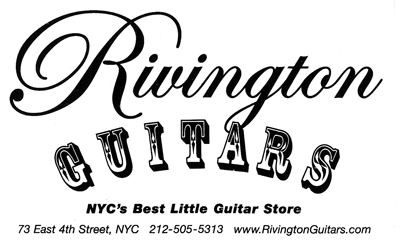 We are very happy to have NYC's Rivington Guitars as a sponsor and the starting point for the procession and St. Mark's Church-in-the-Bowery as another sponsor and as our final destination. The result will be a moving, polyphonic sound cloud layered in compelling, electric rhythms all in honor of this season's axial tilt. 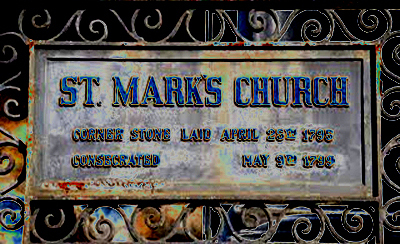 and will end at 7:30 PM at St. Mark's Church-in-the-Bowery, 131 E 10th Street, NW corner of 2nd Ave.
"ce n'est pas un piano"
With the performers Carson Cooman (organ) and singers Lynn Norris (soprano), Donna Breitzer (alto), Milan Rakic (tenor), and Charles Coleman (baritone). Featured artists Christopher Klaich (baritone) and Alistair Reid (organ). "14 Variations on 14 Words"
A power trio is a rock and roll band format popularized in the 1960s. 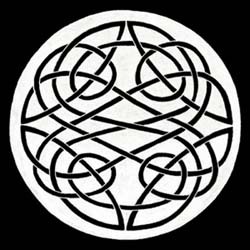 The traditional power trio has a lineup of guitar, bass and drums, leaving out the rhythm guitar or keyboard that are used in other rock music to fill out the sound with chords. While one or more band members may sing, power trios usually emphasize instrumental performance and overall impact over vocals and lyrics. For this performance, three classically trained musicians will give their unique take on this instrumentation in a concert of premieres and arrangements of their works. Thinking that “everything that rises must converge,” these composer/performers have a long history in seamlessly blending elements of serious contemporary music and popular music idioms into epic sound-scapes of orchestral scope propelled forward by driving, compelling rhythms. 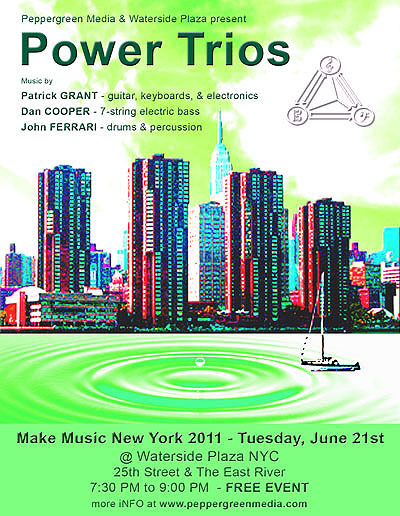 This 90-minute performance is the second presentation that Patrick Grant has created for Waterside Plaza’s participation in Make Music New York. It is a FREE EVENT and is open to a public of all ages. Waterside Plaza’s location on the East River only adds to each and every event it hosts. Make Music New York is made possible with the generous financial support of Bloomberg LP, the New York City Department of Cultural Affairs, and the Stavros Niarchos Foundation. Additional support is provided by Accenture, Betterfly, the Cultural Services of the French Embassy, Deutsche Bank, GigMaven, and HBO. We gratefully acknowledge substantial in-kind support from the City of New York, Jarrell Guitars, Metro New York, Time Out New York, and WNYC. Filmmaker Karin Kaper tells the story of forced displacement of her mother’s family in a very personal way. 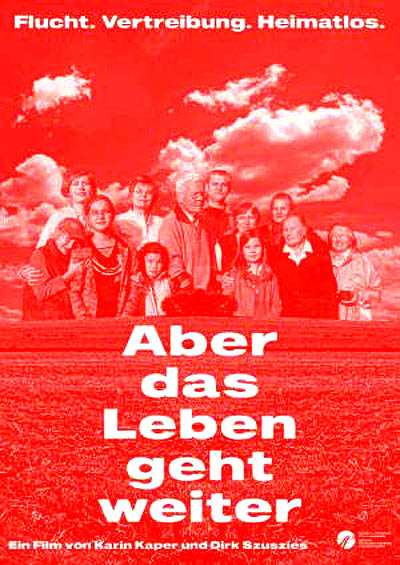 The protagonists of the film are Edwarda Zukowska, her daughter Maria, her granddaughter Gabriela, Ilse Kaper, her sister Hertha and Karin Kaper. Supported with means by the Foundation of German-Polish Cooperation. 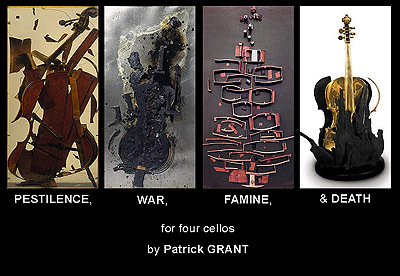 "Pestilence, War, Famine, & Death"
Composers Concordance and Bruka Band will join forces for an evening to explore a variety of angles to the art of performing today. The music traditions include classical, world, jazz, and hip-hop, the cultures of the Balkans, South and North America, interweaving art forms of music, literature, dance, visual projections and photography. 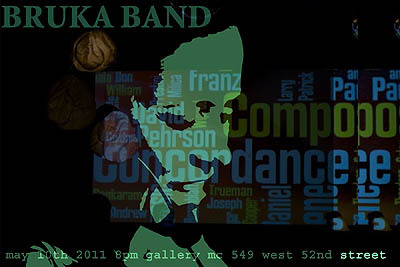 Composers Concordance and Bruka Band are two energetic, daring and diverse collectives of new music composers, performers and new art advocates. For CBCB, they gather an exciting array of New York based musicians and artists including: Bruka Band’s Milica Paranosic, Margaret Lancaster, Jonathan Zalben, Rubens Salles, Richard Manoia, Lauri Galbreath and Peter Christian Hall; and Composers Concordance’s Dan Cooper, Gene Pritsker, Dan Barrett, Lynn Bechtold and Patrick Grant. "The Chamber and Electronic Music of Gene Pritsker"
"DIRTY MARTINI & THE NEW BURLESQUE"
free to all students and the Le Moyne community. 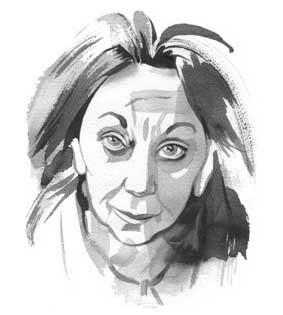 Judith Malina’s revolutionary career with The Living Theatre has spanned six decades, traversed the globe and inspired generations of political theater artists. Members of the ensemble—aged 7 to 70—host an evening of performances and stories from Malina’s history. Dry Opera Company in London. at the Pleasance Theater in Islington. 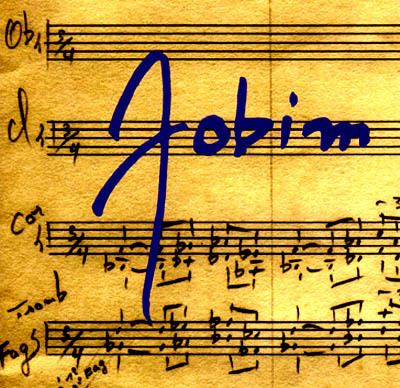 WKCR DJ Jassvan de Lima asked composer/performer Arthur Kampela to put together a group of composers to create their own free and personal musical arrangements based on Antonio Carlos (Tom) Jobim's work for broadcast. 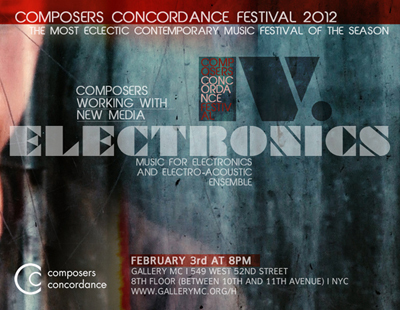 Composers/participants include Arthur Kampela & Alexa, Clarice Assad, Gene Pritsker, Dan Cooper, and Patrick Grant. Label Launch and CD Release PARTY!!!! The event will feature performances by pianist Taka Kigawa, violinist Lynn Bechtold, oboist Keve Wilson, pianist Luis Andrei Cobo, dancers Megan Sipe & Linda Pehrson, with Di. J. Noizepunk (aka Gene Pritsker) re mixing the album. Drinks will be served. 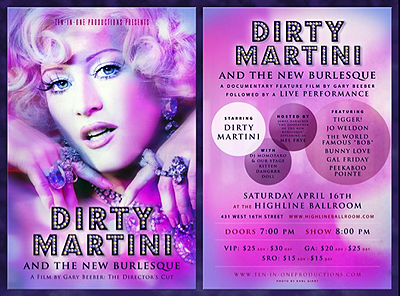 DIRTY MARTINI AND THE NEW BURLESQUE, a feature-length, independent documentary film by Gary Beeber explores the outrageous world of the performers who created the new burlesque scene in New York City. Get to know Miss Dirty Martini and her friends Julie Atlas Muz, World-Famous *BOB*, Bambi the Mermaid, Tigger!, Scotty the Blue Bunny, and many other cult stars. 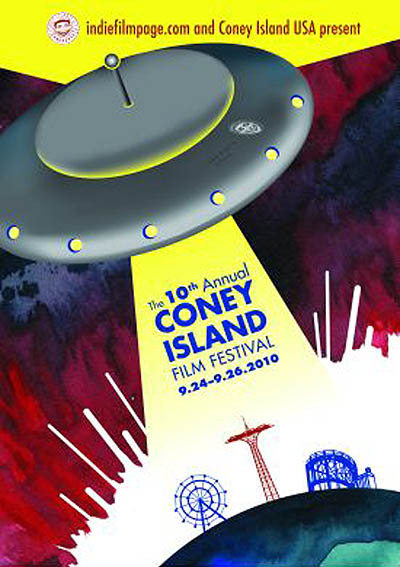 BONUS: Check out this video short from 2005, "Happy Ride, Coney Island"
"Grant’s work is stupendous... 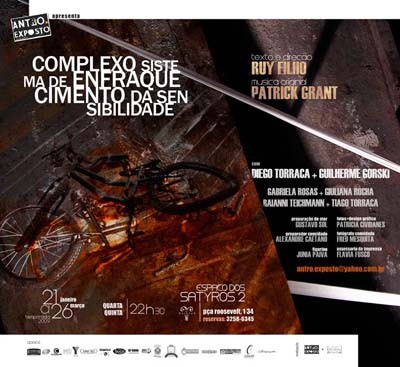 In “Complexo Sistema” it establishes an uninterrupted dialogue of words and action, taking the risky games that Ruy Filho’s actors face to extreme intensities. 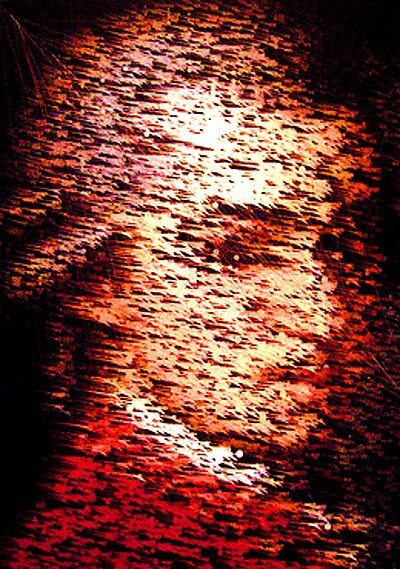 With the dialogue between the music and sound design of Grant on one hand, and the parade of repressive and violent situations conceived by Ruy on the other, the piece could not be stronger. Here, text and soundtrack combine as a unified and inseparable whole in service of the storytelling. The result is powerful." Um torturador e um garoto. A agressão física e manipulação psicológica como sistema de padronização. A resistência, no entanto, dá-se na construção de delírios, fugas da realidade possíveis apenas aos que ainda conseguem imaginar e criar. 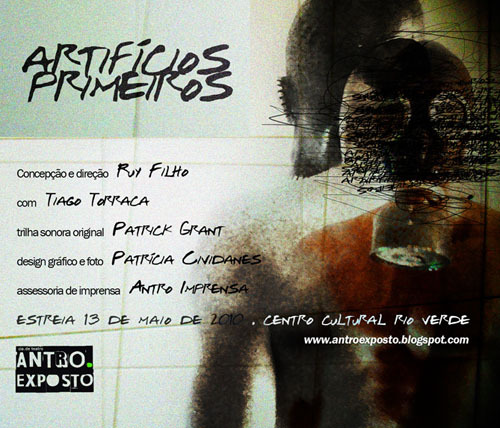 Com trilha original de Patrick Grant, parceiro de importantes nomes do teatro contemporâneo como Robert Wilson, The Living Theatre e Gerald Thomas. “(...) Mais uma vez, o grupo não facilita a vida do público – e aí está seu mérito” (Veja S. Paulo, 12/2008). 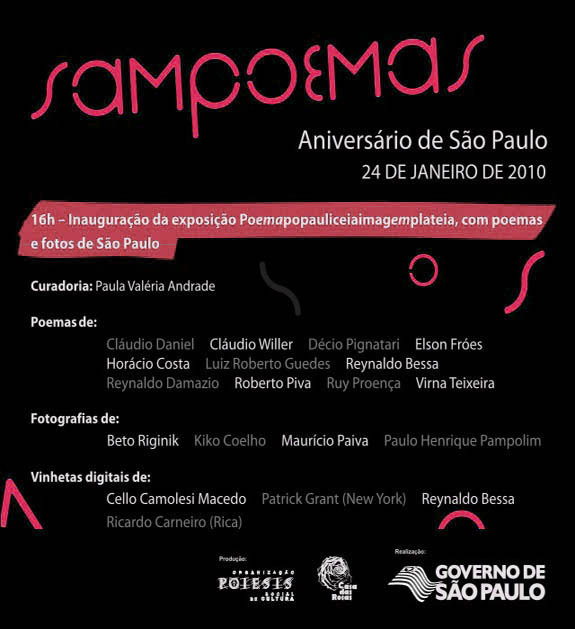 to celebrate the city of São Paulo. 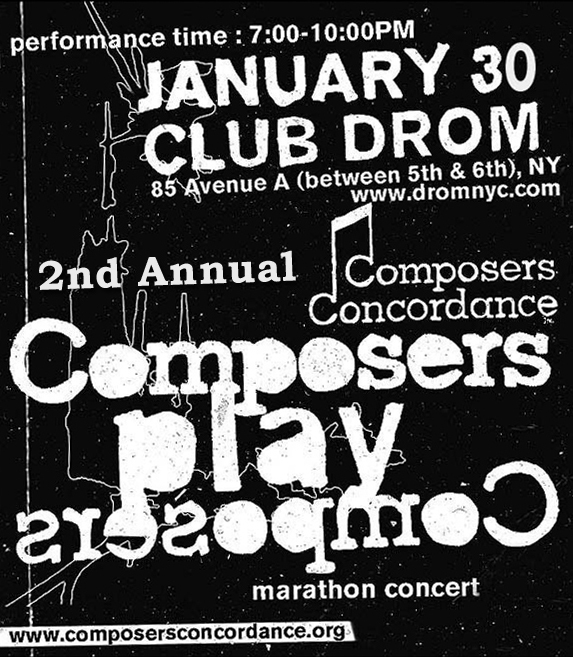 Composers Concordance presents a marathon concert entitled 'Composers Play Composers' on Sunday, January 31, 2010, 6:00 PM doors, 7:00-10:00PM performance. This concert, in collaboration with VisionIntoArt, will consist of a 3 hour performance with 23 composers playing their own works. The marathon will have 3 sets with 2 short 10 minute breaks. The 23 composers are: Roger Blanc, Thomas Bo, Luis Andrei Cobo, Charles Coleman, Dan Cooper, Larry Goldman, David Gotay, Patrick Grant, Franz Hackl, Don Hagar, Arthur Kampela, Alon Nechushtan, Daniel Palkowski, Milica Paranosic, Akmal Parwez, Joseph Pehrson, Gene Pritsker, Paola Prestini, Jody Redhage, Kamala Sankaram, William Schimmel, Andrew Violette, & Theodore Wiprud. Each set will start off with a trio composed by Franz Hackl, trumpet, Charles Coleman, baritone voice and Gene Pritsker on electric guitar. 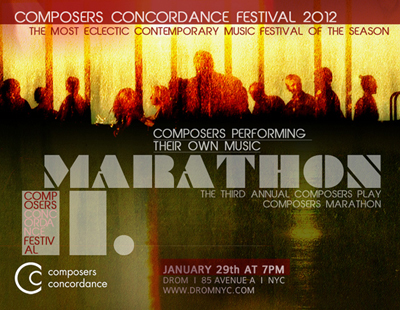 Works and composers featured in the marathon include Arthur Kampela playing and strumming the cello like a guitar, Joseph Pehrson’s piece for piano based on a Beatles song, a composition by Dan Cooper for 7-string electric bass, piano and percussion, a piece for voice and berimbau by Milica Paranosic, a work for soprano sax and piano by Alon Nechushtan, a piece for voice and electronics by Kamala Sankaram and a piano piece by Luis Andrei Cobo. Live visuals by Astrid Steiner (luma.launisch) and media by Carmen Kordas. Tickets are $10 with a mandatory 2-drink minimum. 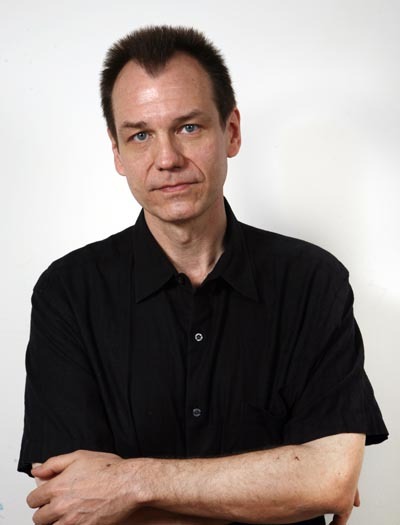 Patrick Grant is the music director for the DEC 18 & 19 production of the Morton Feldman opera for solo soprano "Neither" with a libretto by Samuel Beckett at the Konzerthaus in Vienna, Austria. In a special arrangement with Feldman's publisher Universal Edition, Grant has created a realization of the original orchestration for keyboard, piano and electronics. 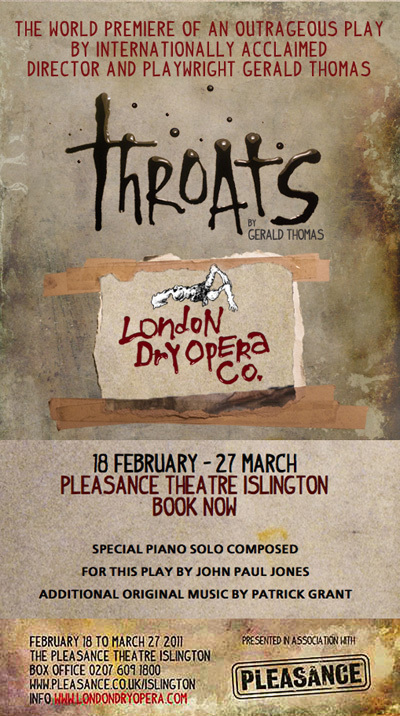 The opera is directed and produced by Thomas Desi of ZOON Music Theater with Kiera Duffy as the soprano soloist. Grant is joined by the renowned Michael Pilafian on piano. Original video projections are by David Haneke. 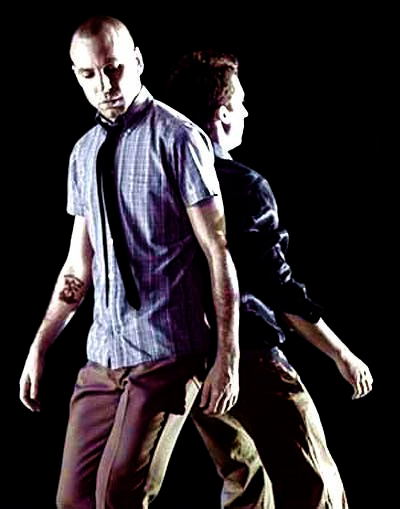 The production features movement artist Roman Maria Mueller. 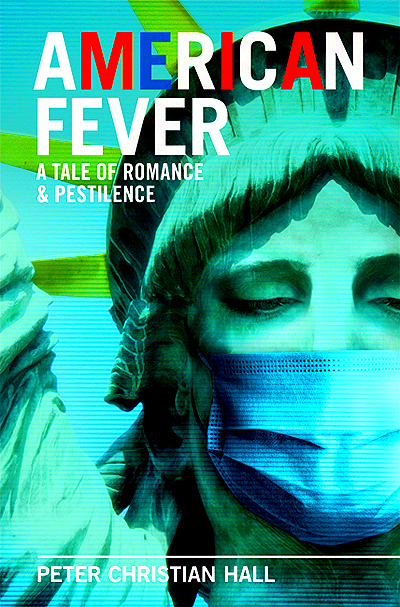 This work had it premiere as a production of the Center for Contemporary Opera in May 2009 and will find Vienna as its first production outside of NYC. 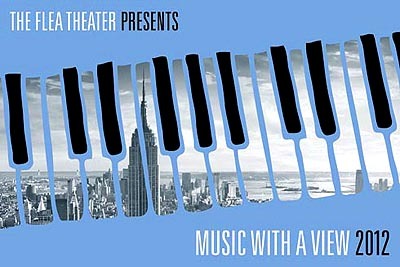 The Flea Theater is delighted to announce the fourth season of Music With A View, a free music series devoted to the discovery of new, fresh sound created and performed by contemporary musicians. The series is curated by Kathleen Supové. 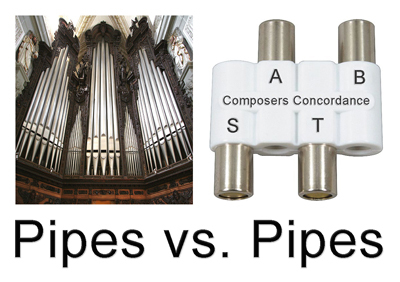 Continuing the theme of instruments, December’s concert returns only somewhat to more conventional media. There will be nothing conventional about this diverse group of voices. Composer Jeff Myers has written an energetic and compelling piece for the exciting up-and-coming Jack Quartet (protégés of Kronos); composer Michael Gatonska has written idiosyncratic works for orchestra and soloists. 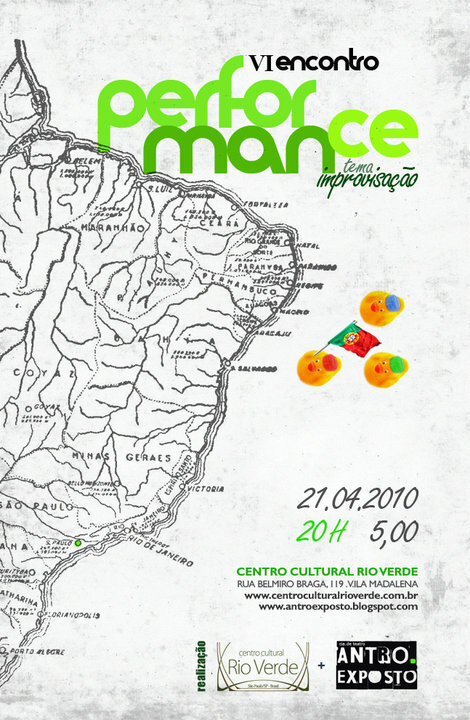 In this concert, he will premiere a work for flute and percussion. Legendary flutist/conductor Paul Dunkel is one of the performers; James Schlefer is a virtuoso on the shakuhachi (the Japanese cousin to the flute! 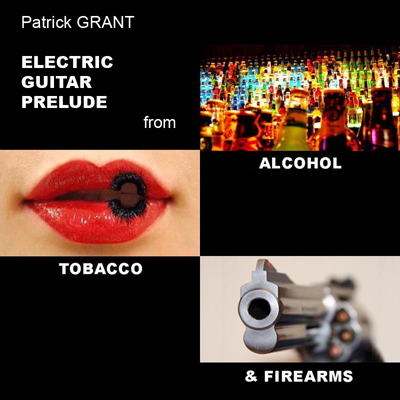 ), he is also composing lately and will be premiering a new lyrical work for an ensemble of Japanese instruments; finally, Patrick Grant has written high-energy music for stage, clubs, films, and burlesque shows. He has led several ensembles, but here he is going solo with electronic keyboard, laptop, and a smorgasbord of electronic effects and sounds. Violinist/composer/electronics wizard Mari Kimura switches roles in December and acts as host of the post-concert discussion. or the 1 to Franklin Street. Centered around a 2008 revival of The Brig, the inflammatory 1963 play that exposed the harsh realities inside a US Marine prison, this documentary by Karin Kaper and Dirk Szuszies puts former Marine Kenneth H. Brown’s drama into historical perspective – and makes a case for its ongoing relevance – through powerful scenes from the recent production in Berlin as well as illuminating interviews with directors of the play past and present, revival cast members, and the playwright himself. 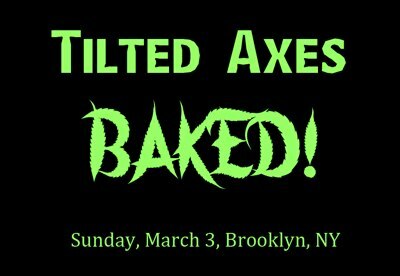 (F train to 2nd Ave.), $10 at the door. Armed with a keyboard, guitar and a lap top, I'll be performing a solo set of music that grooves to the looping and layering of angular interlocking riffs, mash ups of both urban and world beats, and pop timbres used in the service of avant tonality. A sonic soup for the mind, body AND spirit. I hope you can make it. Humayun Khan (Indian classical vocal improvisation, Afghan sufi) Said Tinat, Shahin Shahida (guitar), Bora Yoon (vocals, tanpura), Haroon Alam (tabla, percussion) Douglas J. Cuomo (guitar, electronica). The Stone is curated in the 2nd half of October by Kathleen Supové and its artistic director is John Zorn. Kid Creole And My Cocontus Is a delightful, danceable and very personal documentary memoir chronicling Swiss - born artist/choreographer/designer Adriana Kaegi's adventures as Mama Coconut -- co-founder of the 1980s multicultural tropical funk machine called Kid Creole and the Coconuts and wife to August Darnell, the mercurial man behind the glamorous combo. From jamming in scrappy downtown New York underground dives to performing for American Presidents and Lady Di, Kid Creole and the Coconuts' dazzling success charted the arc of a decade -- and the rise, fall and rise again of the band the New Musical Express (among others) called The Best Live Band in the world. At the center of it all was the stylish, multi-talented Kaegi with an early video camera, "making reality TV before it even existed!" as she laughs. With a rare intimacy, she documents the band's extraordinary experiences, both global and internal. Propelled by the compulsive rhythms of the Kid Creole and the Coconuts extravaganza, this documentary will leave you singing - "You can take anything, but don't take my Coconuts"! 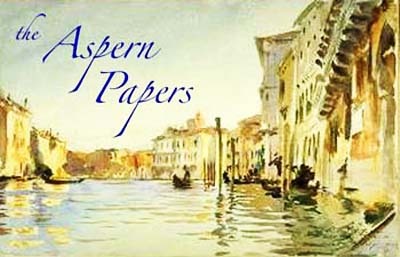 After Party @ ASPEN 30 W 22nd St. The MMiX Festival of Interactive Music Technology was produced by composer/performer Patrick Grant (curator), radio producer Jocelyn Gonzales, and Theaterlab. 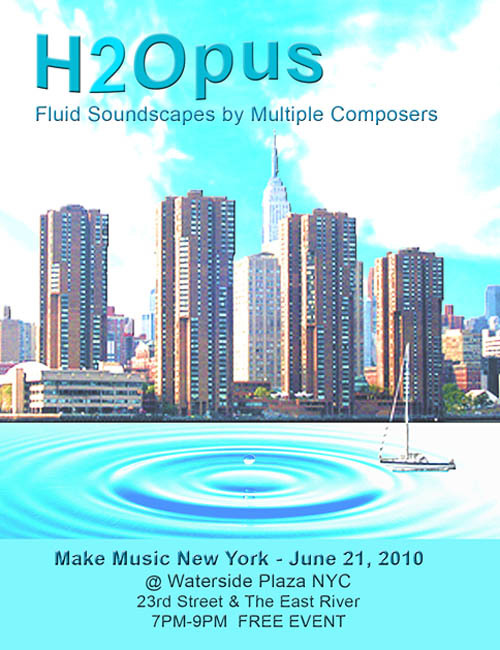 Software and laptop improvements present new possibilities for composer/performers to create complex soundscapes in real-time during live performance. The focus of the festival was to demonstrate that these emerging audio technologies are instrumental in new artistic creations, and to inform the public regarding the current state of this art form. The artists presented in MMiX have set a new bar in that discourse and will provide live performances, media installations and workshops. 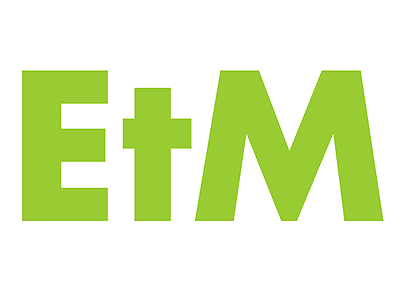 Ableton, creators of LIVE 8 and Cycling ‘74, creators of Max/MSP/Jitter were primary sponsors of the festival with additional support by DubSpot NYC and Eventide. Media sponsorship for the festival was generously provided by WNYC, 93.9 FM and 820 AM, New York City listener supported radio. Após ser torturado em um ambiente árido e inóspito, Bate Man elabora seu raciocínio, dando forma aos seus pensamentos. 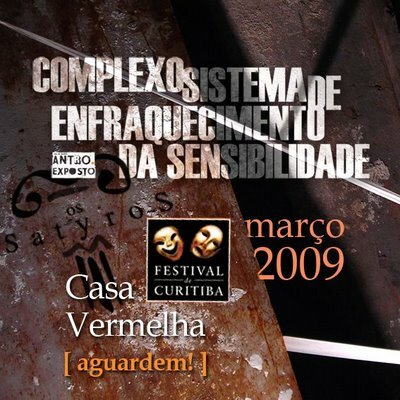 Em um estado de alerta constante, pressionado não se sabe por que ou por quem, Bate Man constrói uma sutil e profunda análise do homem contemporâneo, com seus medos, desejos e ambições. Um jogo perigoso se faz presente, criando um atrito entre a realidade e o imaginário. O mundo em colapso ideológico, a beira do abismo, é o material que Bate Man utiliza para jogar com humor e tensão, provocando uma reflexão para onde a humanidade caminha. Um quebra cabeça misterioso é apresentado com vigor, envolvendo a todos em uma teia sutil de Informações. O espectador é convidado a participar deste jogo / enigma, onde cada lance envolve todos os sentidos. A presentation regarding the upcoming festival AND special performances by Kathleen Supove (The Exploding Piano), Patrick Grant (sTRANGEmUSIC) and LB (aka Pound): a new duo made up of DJ Scientific (Elan Vytal) & 6-string electronic violinist String Theory (Matt Szemela). Wine reception to follow. It's another hot, steamy Monday evening in the city. You've been plug-in away all day and your circuits are fried. Well, we know one place where you can cool your compressors and chill out to some great new music... 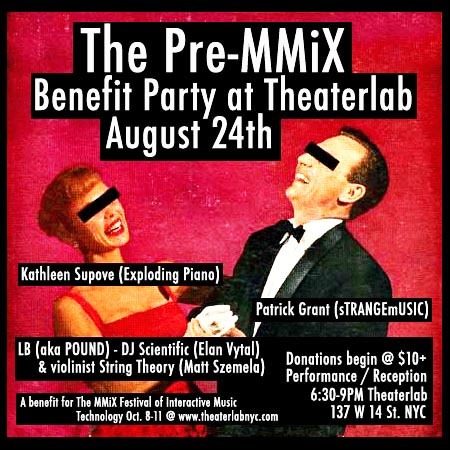 It's "The Pre-MMiX" at Theaterlab, a benefit party for The MMiX Festival of Interactive Music Technology, happening on August 24th, 2009 at 6:30pm. The Pre-MMiX Party will offer a sampling of the kind of vibrant works we'll feature this October 8-11 at MMiX, and will also serve as a fundraiser for the festival. If you can not make it, and would still like to contribute, you can also make a tax deductible donation HERE. 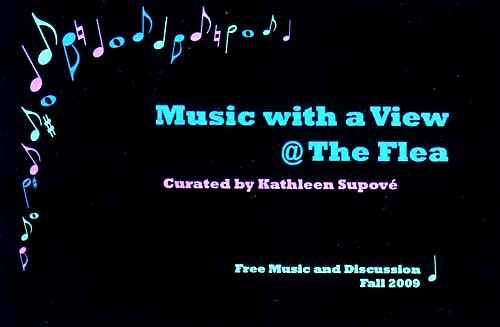 Kathy Supove is well-known for displaying her virtuosic and theatrical keyboard skills in her Exploding Piano series, and she's curator of the Music With a View concerts at The Flea Theater. We talked to her earlier this summer about her work with interactive electronics in this bit of audio. 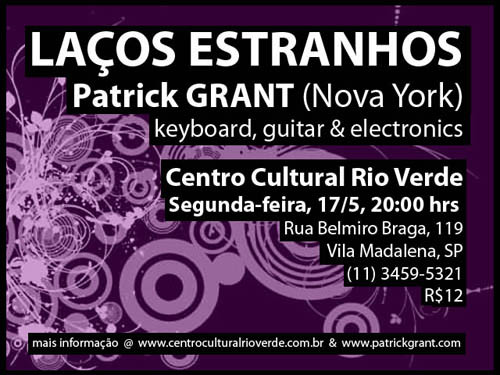 Patrick Grant, creates scores and soundscapes for film, theater and media. Patrick, curator of the MMiX Festival in October, will talk a little bit about the mission, the artists and the technology behind MMiX, and will school ya on some of his "sTRANGE mUSIC" at the Pre-MMiX party. So next Monday evening, August 24th, come on up and escape the summer distortion at the Pre-MMix Benefit Party. 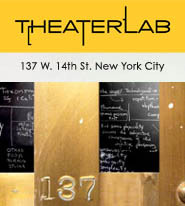 The event starts at 6:30pm at Theaterlab's studios and a wine reception follows the performances. and near the F and L train, as well as Union Square. The suggested minimum donation at the door will be $10. The album release of Adriana Kaegi's TAG (Best of the Month on Amazon.com), a live performance with co-producer Patrick Grant and musicians, and a preview of the delightful, danceable and very personal 50 min. film memoir about the legendary band Kid Creole and the Coconuts which Kaegi co-founded before starting to sing to her own tunes. continental zone set somewhere between downtempo, chill-out, electronic lounge and dance." "Kid Creole and My Coconuts" is a new documentary by producer, director and "Mama Coconut" Adriana Kaegi about the rise and fall and rise again of the 80s multicultural tropical funk machine "Kid Creole and the Coconuts" called by many "the best live band in the world." Kid Creole and the Coconuts are an American musical group created and led by August Darnell. Their music incorporates styles like big band jazz, disco, and in particular Caribbean/Latin American salsa. 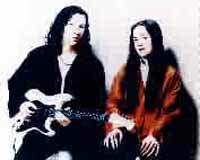 The Coconuts are a glamorous trio of female backing vocalists whose lineup has changed throughout the years. Darnell began producing for other artists before adopting the name Kid Creole (from the Elvis Presley film King Creole) in 1980, and forming The Coconuts, a trio of female backing vocalist/dancers, including his wife Adriana Kaegi, and a band including his associate vibraphone player Andy Hernandez aka Coati Mundi, who served as co-leader as well as musical director and arranger. One of their standout works was Fresh Fruit in Foreign Places, a concept album matched with a New York Public Theatre stage production; it received rave reviews, and Darnell was recognized as a clever lyricist and astute composer, arranger and producer. The documentary features concert footage, never-before-seen home movies, and a new interview/commentary with producer and ex-coconut Kaegi with "The Punk Professor" Vivien Goldman. The movie is edited by Peter Shelton with sound design by Patrick Grant. 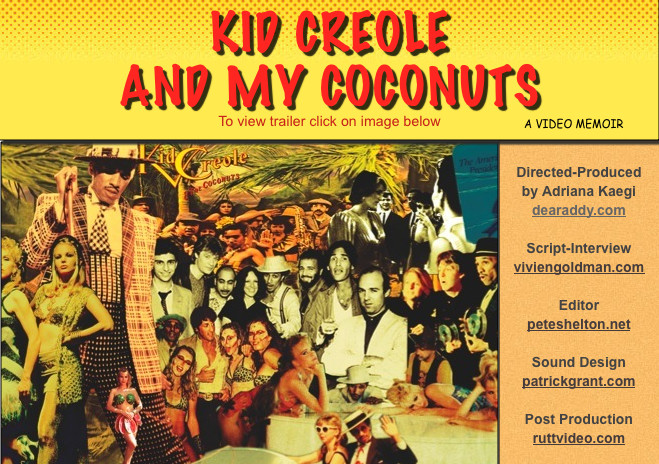 For more iNFO, go to the "Kid Creole and My Coconuts" documentary's official web site HERE. 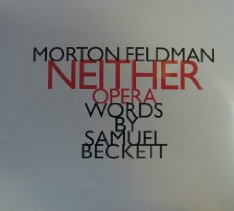 The Center for Contemporary Opera (CCO) in NYC has chosen Patrick Grant as the music director for their May 13 & 14 production of the Morton Feldman opera for solo soprano "Neither" with a libretto by Samuel Beckett. In a special arrangement with Feldman's publisher Universal Edition set up by CCO's artistic director Eric Salzman, Grant will be creating a realization of the original orchestration. Although the work has been performed many times in concert, this will be the first time it will be staged. This world premiere opera will be directed by Thomas Desi of ZOON Music Theater with Kiera Duffy as the soprano soloist. 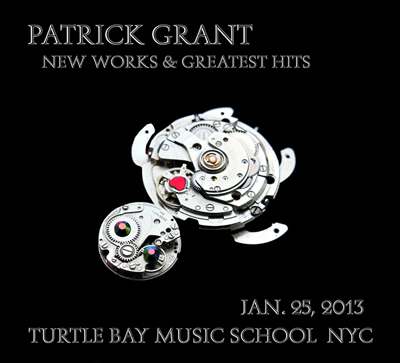 Grant will be joined by the renowned Michael Pilafian on piano. 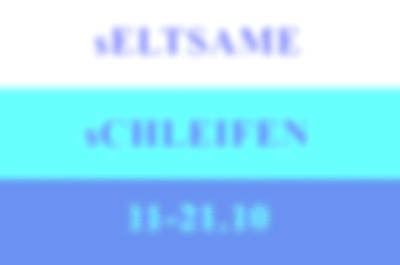 This work will continue on to the Wien Modern Festival later this year. Monday, March 23, will be a day of screenings of documentaries and Living Theatre works from 1965-present. Wednesday, March 25, will feature readings and an afternoon discussion with Marvin Carlson, David Savran, and others. The event will culminate in the presentation of the Edwin Booth Award to Judith Malina, in recognition of the Living Theatre's outstanding contributions to the New York performance community. 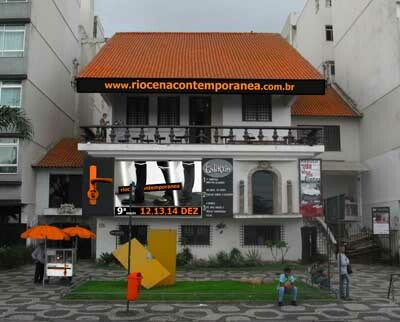 of one of Rio's brightest cultural landmarks. 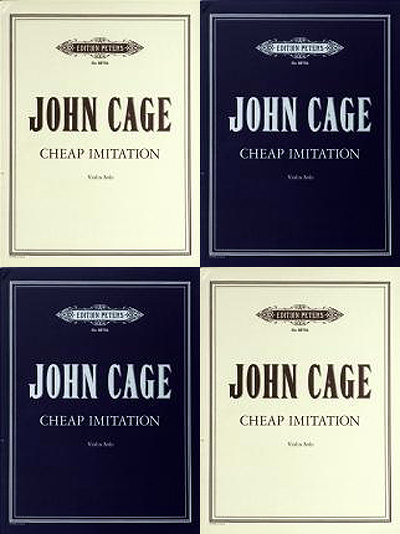 From “The Art of Noise” (1913) to contemporary Noise-as-Art, this series traces the lines drawn from Marinetti’s 1909 manifesto, through the Surrealists, the Epic Theater, John Cage’s “The Future of Music: Credo,” The Living Theatre, Robert Wilson & his collaborators, Downtown New York Performance Art, and the digital boom that since the 80s has made the latter day artistic visions of what theater could be a modern day reality. 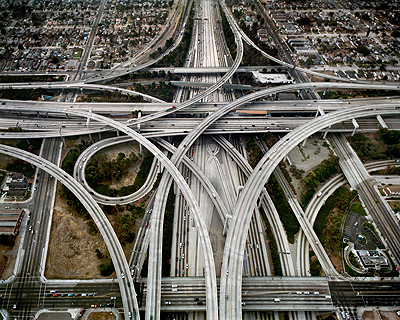 Sonically, anybody can have anything from an orchestra to a traffic jam available at their fingertips. Now that everybody is using computers and that the playing field has become so even, what qualities make certain works stand out? To find out where we’re going it’s necessary to find out where we’ve been. This 3 part event is comprised of lecture, multi-media projection, and full of audio examples. Geared for the curious artistic community at large, by the final session, willing participants will be able to create small, staged narratives using current techniques and readily available software. Performances are on Wednesdays through Saturdays at 8 p.m.; Sundays at 4 p.m. Tickets will be $20 with a discounted ticket of $15 for students, seniors andmilitary. 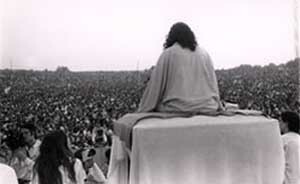 The production involves audience interaction, so there are no seats and each performance can only accommodate 50 people. 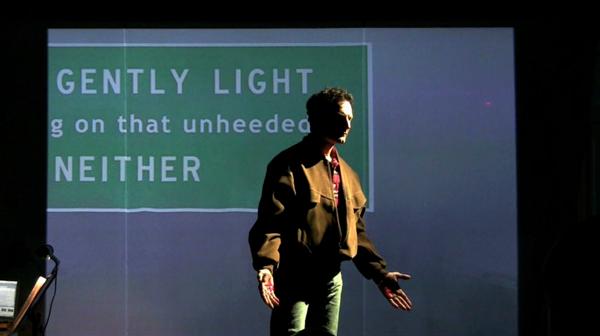 The Living Theatre began its 2008-2009 season with the limited run of Judith Malina and Hanon Reznikov's Eureka!, based on an Edgar Allan Poe essay about the origin of the Universe. 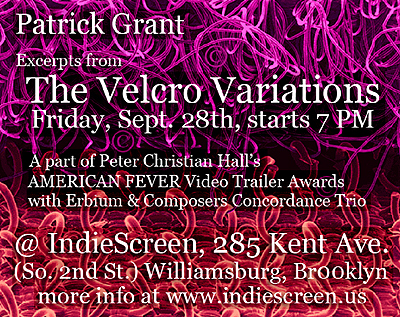 The production is directed by Judith Malina and features an original score by Patrick Grant. Published in 1847, the "Prose Poem," as Poe called it, lays out with astonishing forethought what has since come to be called the Big Bang Theory. 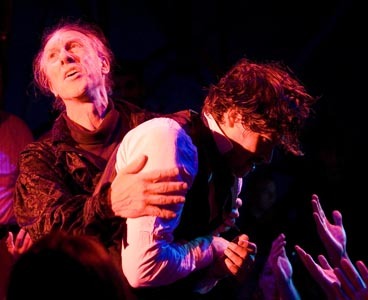 The Living Theatre has adapted Poe's text to a theatrical form, which will provide the audience with an awareness of participating actively in the creation of the universe and realize the parallel between the development of the elements of the cosmos and our own human development. Eureka! was conceived and written by Hanon Reznikov when he read Poe's text - but he did not live to finish the task. Judith Malina, his collaborator and the director of the play completed the script. 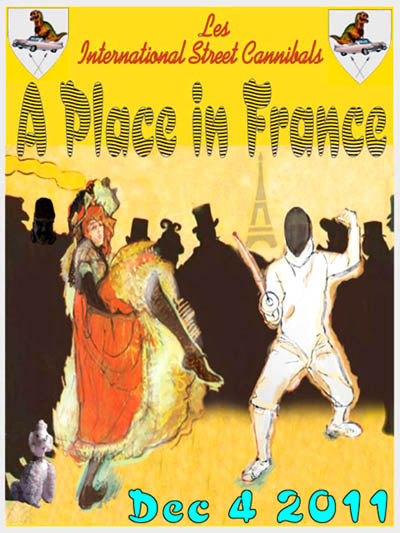 The purpose of the play is to provide the audience with a sense of empowerment. 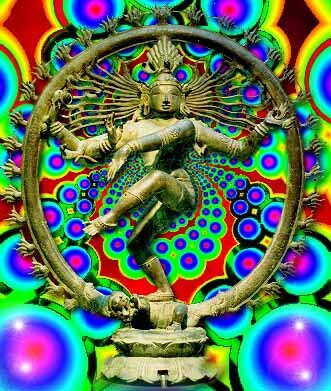 By participating in the creation of the known universe we communicate the possibility of creating a more harmonious social structure. 'Eureka!' joins nearly one hundred Living Theatre productions created since 1951, all of which seek to expand our knowledge of the universe. The cast of Eureka! features Anthony Sisco as Edgar Allan Poe, Silas Inches as Alexander von Humboldt, Gene Ardor, Yasemin Ozumerzifon, Eric Olson, Maia Larraz, Erin Downhour, Kennedy Yanko, Enoch Wu, Katherine Nook, Isaac Scranton, Eitan Brigantonelli, and you the audience. The Assistant Director is Brad Burgess. Set & Lighting Designer is Gary Brackett, Technical Direction is by Evan True. Choreography is by Gene Ardor. 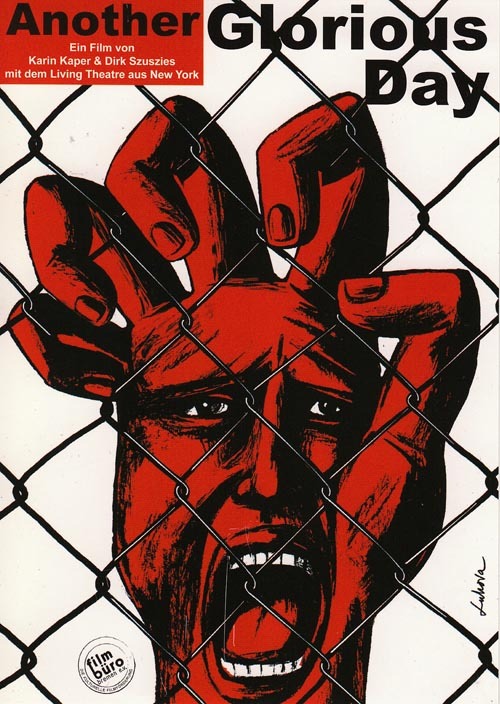 Premiered at The New Theater in the East Village in 1988, this is a Cold War piece written for Protean Forms Collective’s Spring ‘88 New Works Festival. It was the last summer of Reagan’s Presidency, New Wave was old, nuclear holocaust television dramas were the entertainment, and the events that led up to the Tompkins Square Park Riots were brewing. Musically, the piece uses that age-old pentatonic (Eastern) taunt used by children in many cultures (c-A-d-c-A) as a sonic commentary on the inherent childishness of violence. 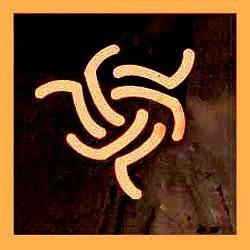 This is placed in various formations and textures against minimalist rhythms and harmonies (Western) prevalent in New York City in the late 80s. The Mighty CCi House Band performs! 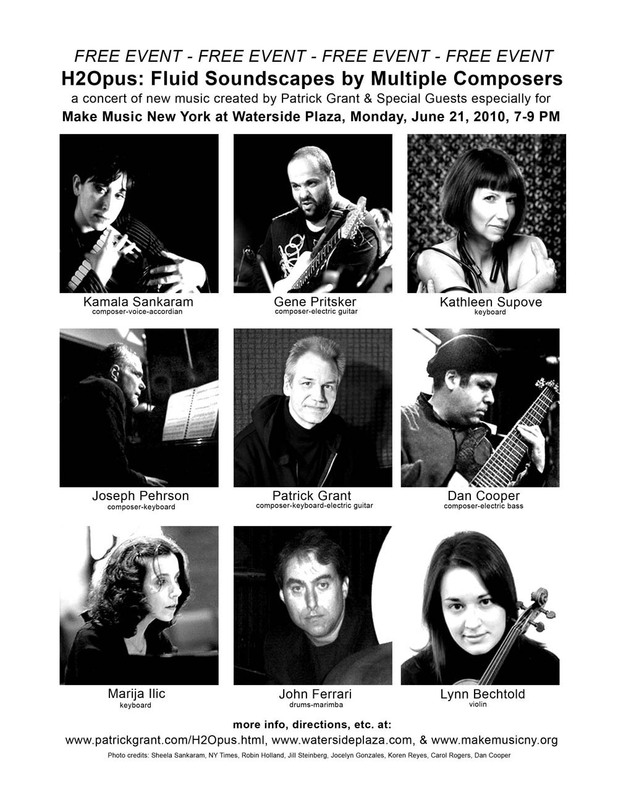 Make Music New York is a citywide summer solstice event based on France's Fete de la Musique. The festival is an international phenomenon, taking place on the same day in more than 300 cities in 108 countries, including Germany, Italy, Egypt, Syria, Morocco, Australia, Vietnam, Congo, Cameroon, Togo, Columbia, Chile, Mongolia, and Japan – and New York. 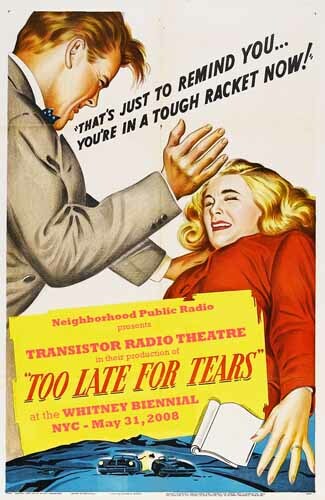 the original music and sound design for Transistor Radio Theatre's production of the radio noir thriller "Too Late for Tears" as part of the Neighborhood Public Radio Project. You can show up as a member of the studio audience, listen in locally at 99.1 FM or drop in at the online link at 5:00 EST. programming from another publicly accessible location in New York. 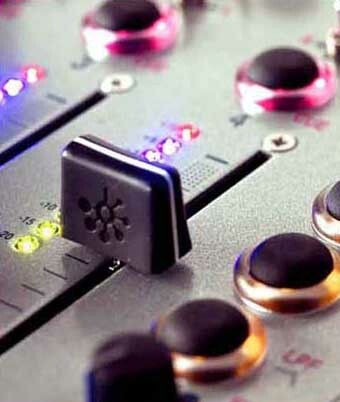 It will also install remote studios or Portable Radio Instruments(PRIs) in cities across the US, each sending live community radio programs to the New York hub. "Too Late for Tears" is adapted by Laurann Williams from the movie of the same name. 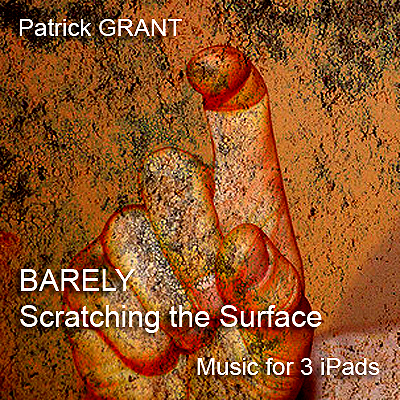 "Patrick Grant's music and sound cues are evocative..."
the gamelan blends with an electronically processed music box and a familiar tune. the entire gamelan plays as a giant music box in ths fantasy for double suling (flute) . 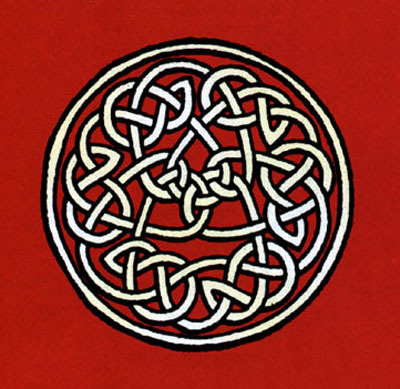 a stately, neo-baroque, harmonic trance with keyboard. “telling time,” where each performer tells a story through use of shifting tempi. 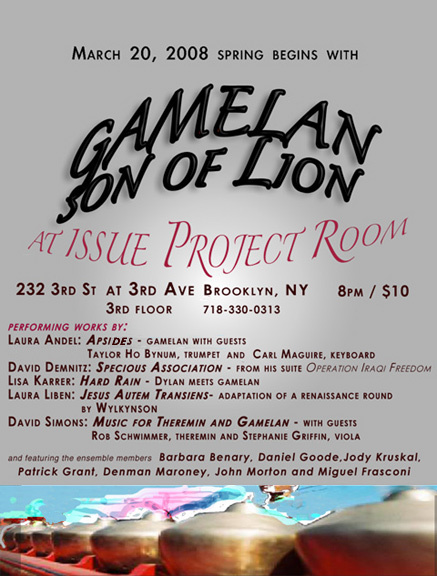 a romp of the gamelan through Toyland, including the softest sound you can imagine. milling, is a preindustrial way to preshrink wool by pounding. a Dylan classic arranged for gamelan. Kehinde Wiley creates larger-than-life-size portraits that mix historical Western European painting styles such as French Romanticism, Rococo, and Baroque with images from contemporary urban streets. The resulting monumental works are painted in Wileys characteristic, flamboyant style and presented in ornate gold frames. While the artist evokes important and highly recognizable paintings from the past, he replaces those works elite white sitters with African-American men. The Modern Art Museum of Fort Worth, Kehinde Wiley Studio & Deitch Projects have commissioned Patrick Grant to create live music especially for the opening gala on the night of April 18th. It will be performed by the Marching Band of Trimble Tech, directed by Earnest Colvin. Modern ’til Midnight returns April 18 with a night of world-class art and unique performances. Experience the art with tours designed to engage and entertain by providing imaginative ways in which to connect with the artists’ creations. To celebrate the opening of FOCUS: Kehinde Wiley, a special performance by the Trimble Tech High School Marching Band, performing a unique composition by Patrick Grant under the direction of Earnest Colvin. Patrick Grant is a New York City composer who is the Musical Director for Special Projects for Kehinde Wiley. 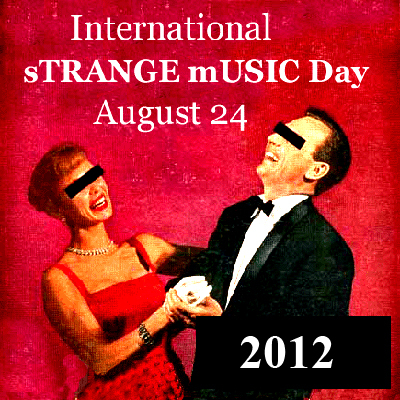 In addition, Yellow Fever, The Theater Fire, PPT, and Strange Fruit Project will provide an incredible evening of music. With dinner served in Café Modern from 6 to 9 pm, late-night shopping, and DJ Sober and others in the lobby, there is sure to be something for everyone. This event is open to the public. Admission is $15; free for Modern Members. Take F or G to Carroll Street Stop, walk east down 3rd street to 3rd Ave.
walk west on 3rd street to 3rd ave. Inspired by 2007 Nobel Prize Laureate Doris Lessing's novel, The Diary of Jane Somers, the Obie Award-winning The Living Theatre presents the encounter of two women of different ages and differernt classes, an elderly, poor woman living in squalor, and a middle-aged fashion editor near the top of her career - they bridge a series of cultural-historical gaps and develop a deep love for one another - Maudie & Jane presents a vision of the depth of communication possible beyond the barriers of class and age. Judith Malina is the willful, self-possessed crone Maudie, declaring her independence at every turn and Pat Russell is Jane, in crisis despite herself and her success, and finding in Maudie the possibility of other levels of communication that transform her life. Written by Luciano Nattino, directed by Hanon Reznikov, designed by Gary Brackett, music by Patrick Grant. 44-02 23rd St. at 44th Rd. The Young Eight is a string octet of African American string players from The Boston Conservatory, Columbia University, The Juilliard School, Manhattan School of Music, Mannes College of Music, New England Conservatory of Music, Peabody Conservatory of Music, Rice University and the University of Texas at Austin. Founded in 2002 at the North Carolina School of the Arts by director Quinton I. Morris, the critically acclaimed octet has established itself as one of the next generation's most dynamic and energetic chamber ensembles. The octet was awarded a Recognition of Achievement and Proclamation by the King County Council (Washington State) and the "Best New Chamber Music Award for 2005" by Seattle Weekly Newspaper. 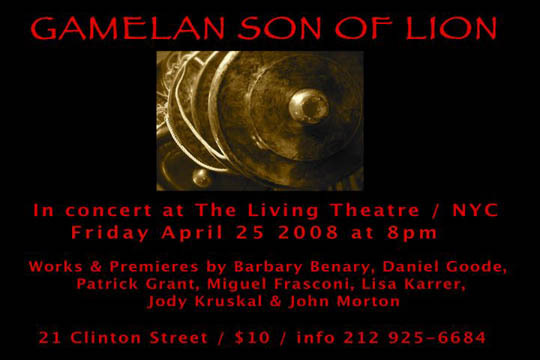 They have collaborated with guest artists, including Metropolitan opera soprano Indra Thomas, pianist David Antony Lofton, poet/spoken word artist Toyia Taylor, The Providence String Quartet, members of the Miró String Quartet and composers, David N. Baker, Michael DePaul, and Earl Louis Stewart. 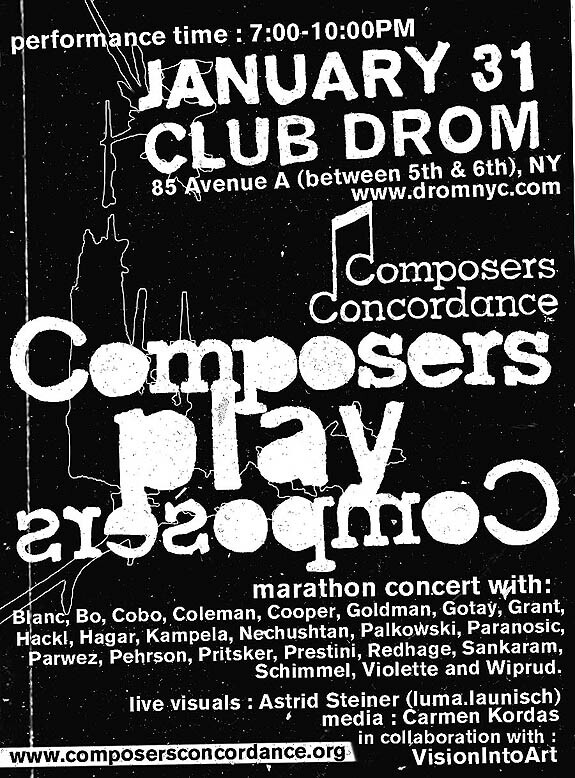 In 1996, composers Philip Glass, Eleonor Sandresky, and Lisa Bielawa created Music at the Anthology as an advocacy vehicle for young composers--presenting their pieces on a week-long festival held each spring in New York City. To date, MATA has commissioned 39 works, and has presented over 120 performances of pieces by composers such as Gordon Beeferman, Derek Bermel, Nick Brooke, Annie Gosfield, Patrick Grant, Nico Muhly and many more. In honor of Music at the Anthology's 10th anniversary season, they've put together a highlight reel of world premiere concert recordings drawn from a decade's worth of MATA festival performances. We hope you enjoy the ride. Listen in as the American Music Center's Counterstream Radio broadcasts world premieres from MATA's first 10 years! Many of these work were also commissioned by MATA, and feature some of the most respected composers and ensembles in contemporary music. For more info, please visit the Counterstream's site. Or, just listen to CS now! "Queen Liar" is a total Wagnerian spectacle! What a soundtrack! What lighting! A 'dry opera' with the raw musicality of this eddy of words and images that is the world in which we live! I loved it! Espetáculo duplo de Gerald Thomas. 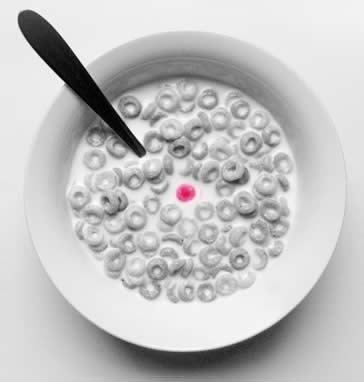 Imagem da contemporaneidade, é uma crônica desdobrada em manifesto teatral, onde o diretor despeja, como em um fluxo de pensamento, aquilo que pensa e aquilo de que duvida. "battle gracefully to be legendary"
third swan from the end pits the extreme virtuosity of the voguing aesthetic against narratives of escape, fantasy, and tragedy, demonstrating how transformation and keenness of adaptation relate directly to our social survival. 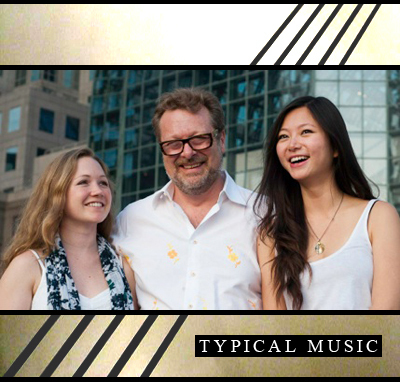 For the music of third swan, Jones has enlisted two composers, Patrick Grant and Amber Lewis a.k.a. GaDgEt GiRl, to manipulate classic house-music standards, one to re-work the bass-heavy rhythms into orchestral arrangements and one to extract their musical source, whether it be from B-grade karate films, beauty pageants or Japanese Shogun operas. third swan from the end takes place at The Galaxie, 2603 W. Barry, Sept. 21-22, at 8 p.m.
After the performance on Sept. 22, Chicagos own House of Avant Garde will host a mini-ball spectacular, which will surely be the perfect culmination to a weekend of wild performance, transformation and innovative storytelling. 866-468-3401; $12-$18. R$ R$ 15,00; R$ R$ 7,50 (usuário matriculado e dependentes). R$ R$ 5,00 (trabalhador no comércio e serviços matriculado e dependentes). De 07/08 a 29/08. Terças e quartas, às 21h. As an extension of his exhibition "Columbus," the artist Kehinde Wiley and Roberts & Tilton Gallery commissioned string quartet arrangements from Patrick Grant of hip-hop for performance at the opening in LA in the Spring of 2006. 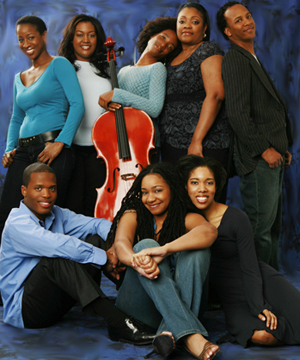 This music, performed in concert by The Young Eight under the direction of Quinton I. Morris, has gone on to become part of their nationwide Black College Tour from October 2006 through July 2007. "These exceptional musicians come from Americas foremost prestigious music schools and conservatories. This critically acclaimed octet is dedicated to exposing communities to the arts through classical music. Their performances will feature winning music from their Emerging Composers Competition as well as some cool and edgy hip-hop arrangements for quartet. Also on the program will be works by George Walker and Edward Elgar." 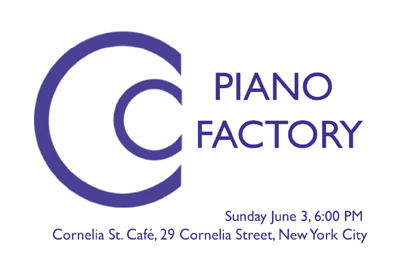 play Terry Riley's "In C"
the first day of summer and CCi's first Make Music NY event. Guitarist Don Vitsentzos studied classical music at the University of California at San Diego under the direction of recording artists Celin and Pepe Romero. Currently he studies ancient music under renowned lutenist-guitarist Jerry Willard and performs regularly in the New York area. Sitarist Aloke Dasgupta is among the most acclaimed performers of North Indian classical style. Grounded in the maihar gharana of Maestro Allauddin Khan (Ravi Shankar's music guru), Maestro Dasgupta has pioneered a versatile and original style that bridges classical tradition with contemporary sensibilities. 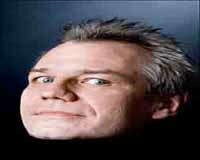 He made his debut in 1981 at the New York Folk Festival, introduced by composer-performer David Amram. Since then, there has been a steady stream of acclaimed concerts in Tokyo, Osaka, Paris, Berlin, Frankfort, and in New York at Lincoln Center. Along with his wife, classical vocalist Sanjukta, he runs the Raga Ranjani School of Music in Los Angeles. Tabla virtuoso Aditya Bannerjee is on the faculty of the Raga Ranjani School of Music. He has performed for England's royal family, Nelson Mandela, and the Dalai Lama, and frequently records with many of India's foremost classical musicians. 841 Broadway @ 13th St.
Longe dos palcos cariocas desde 2005, quando dirigiu Marco Nanini em Um Circo de Rins e Fígados, GERALD THOMAS volta ao Rio em dose dupla. Vai apresentar Terra em Trânsito e a inédita Rainha Mentira em programa duplo. RAINHA MENTIRA - Nesse espetáculo, Gerald Thomas faz um levantamento alegórico da pulverização das tragédias históricas, como o holocausto, as guerras em geral e de assuntos absolutamente pessoaís. Como a vida extremamente triste de sua mãe, acusada aos nove anos de idade pelo enforcamento do próprio irmão, um jovem de 17 anos em uma Alemanha já por WWII. Theater for the New City  155 First Avenue @ 10th St.
PG has been commissioned by The Columbus Museum of Art to create an instrumental performance of hip-hop and old skool music for The West Village Ensemble: flute, 2 violins, viola, cello, double bass and harpsichord, David Burnett, concertmaster. Kehinde Wiley has gained recent acclaim for his heroic portraits which address the image and status of young African-American men in contemporary culture. In this exhibition organized by the Columbus Museum of Art, Wiley will create a new cycle of paintings based on Old Master works from the Museum's permanent collection. Models discovered by the artist on the streets of Columbus dress in contemporary urban fashion as they mimic poses from these historic works. The sacred and secular themes of the Renaissance and Baroque references give new meaning to embedded codes of gesture and dress, past and present, while provoking a reconsideration of lingering stereotypes about masculinity, race and class in our society today. A video of the artist's process of creating this unique project for Columbus will accompany the exhibition to be installed in a recreation of an opulent Baroque salon. 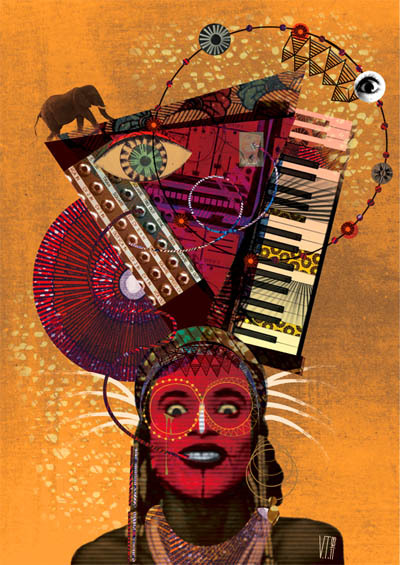 PG has been commissioned by Kehinde Wiley to create a performance of hip-hop and old skool music with the coloratura soprano superstar Shequida* for her and tenor, baritone, and bass singers accompanied by an ensemble of flute, 2 violins, viola, cello, double bass and harpsichord. "To see the past we have to run the film in reverse." BIG BANG is a new work of concert theater in development for narrator, live musical ensemble and projections, written and directed by composer/performer Patrick Grant. This work is the result of a collaboration between the Grant and astronomer Charles Liu with input from physicist Brian Schwartz. The piece tells the story of the creation of our Universe as best as we understand it today. 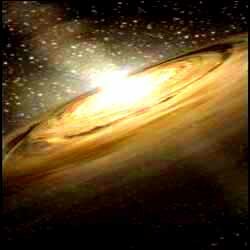 It is narrated by a central character known as The Astronomer. This role will be performed by Charles Liu and like all astronomers do, in order to understand what happened at the beginning, he will "run the film in reverse," that is, the story starts out in our present day and moves backwards to, quite literally, the creation of Time. Projections of stellar bodies, scientific diagrams and art will add a visual component to the work. 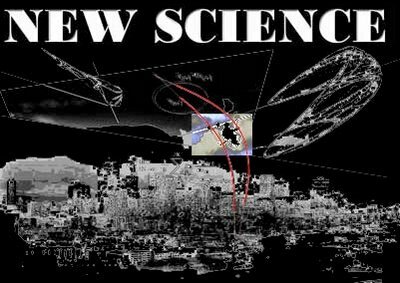 This work was commissioned by the CUNY Graduate Center Science & the Arts performance series, an initiative of the Science Outreach Series, presenting programs in theatre, art, music, and dance that bridge the worlds of art and science. Most programs are free, but please reserve your seats in advance by phone or email. Please refer to the reservation number listed with the event. 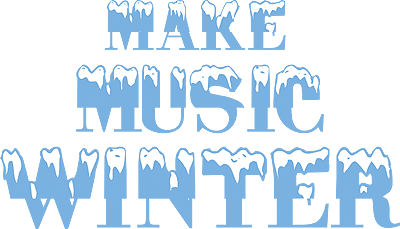 Supported in part by the National Science Foundation and the Lounsbery Foundation. 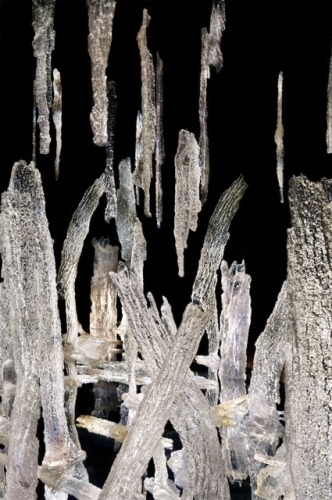 "Stepping into Diane Tufts installation is akin to entering an arctic cave of natural forms, trapped and frozen in time. Created from resin, Tufts environment of ice-like structures creates a spirited sense of wonder and exploration. A musical component adds another mesmerizing layer to the visitors experience." 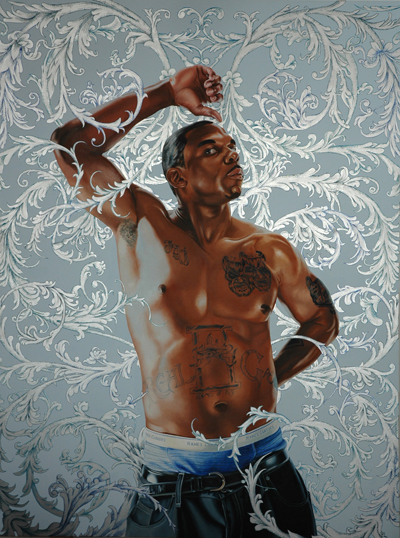 Columbus, an exhibition by New York based artist Kehinde Wiley, whose portraits of African American men combine elements of modern culture with an Old Masters influence, will be on view June 3, 2006, through July 8, 2006, at Roberts & Tilton. 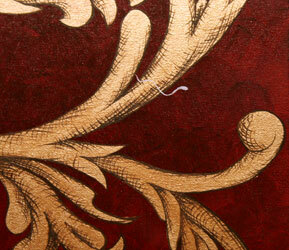 The exhibition will consist of an environment referencing staid, museum traditions and philosophies. Each of Wileys paintings included in the exhibition is based on specific masterworks from the Columbus Museums permanent collection where the exhibit will travel in September 2006. Wileys work incorporates a range of artistic vernaculars directly from art historical references to a looser, more hybridized concept of modern culture ranging from French Rococo to todays urban streets. He collapses history and style into a unique contemporary vision. 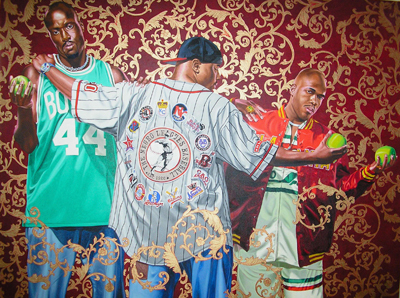 Wiley describes his approach as interrogating the notion of the master painter, at once critical and complicit, and he creates large scale figurative paintings that quote historical sources and position young black men within that field (of power). The vividly colorful paintings, often adorned with ornate gilded frames, depict young black men in urban dress, and posed in a manner reminiscent of Renaissance artists such as Tiepolo and Titian, and surrounded with a barrage of Baroque or Rococo decorative patterns. Using models from the city of Columbus and inspiration from the figures in the paintings at the Columbus Museum, these portraits examine not only how African American males are perceived by others, but also how they see themselves, while also simultaneously examining the significance of ornamentation and range of iconography. September 8, 2006 - January 7, 2007. Support for the Roberts & Tilton presentation of Kehinde Wiley: Columbus provided by Nike. Hip-hop music scored by Patrick Grant will be performed by string quartet members of The Young Eight at the opening reception June 3rd. 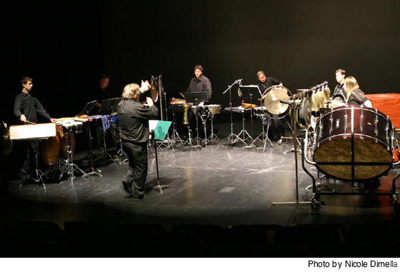 For the Spring 2006 series CUNY has commissioned Patrick Grant to create and direct a concert theater work about the Big Bang and origins of the universe. PG will be working with the renowned astronomer Charles Liu in the development of the narration. More than 50 years ago, Judith Malina and her husband, painter Julian Beck, founded The Living Theatre, a revolutionary ensemble that altered the history of the western stage. Filmmakers Karin Kaper and Living Theatre veteran Dirk Szuszies trace the company's dramatic and colorful history with interviews and archive film clips. 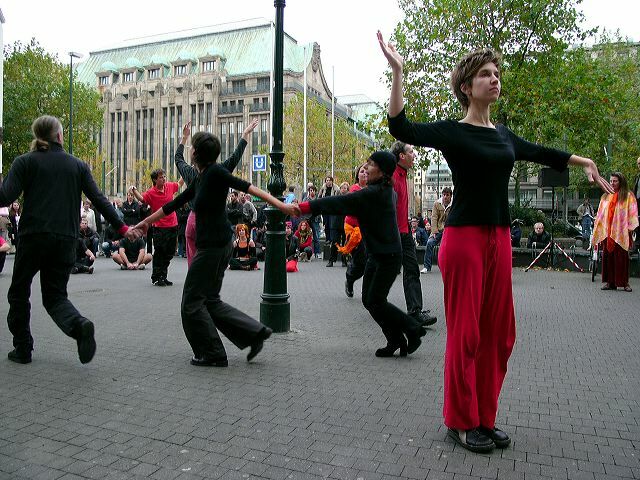 Today The Living Theatre remains vibrant under the direction of Malina, and is seen staging politically active events and locations around the world, from the Genoa G8 conference in 2001 to New York's Ground Zero. am 2.3. um 20.30 in den Hackeschen Höfen Berlin in Anwesenheit der Regisseure und Gästen und im Filmhaus Köln, anschließend deutschlandweit. Der Film handelt die Ereignisse und Schauplätze nicht chronologisch ab, sondern entwickelt sein eigenes Anordnungsmosaik, begleitet von der stets nach vorne drängenden Musik des New Yorker Komponisten Patrick Grant. "Lonely Ride, Coney Island," the follow-up to "Happy Ride, Coney Island," will have its premiere at the Coney Island Museum on Oct. 15 when it is part of artist and director Gary Beeber's one-man show and installation. 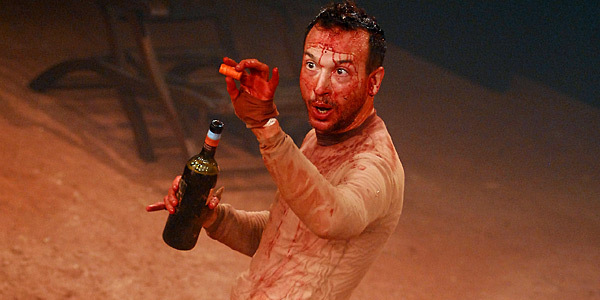 The show runs through January 2006. Climbing the staircase to the second floor of our historic building at 1208 Surf Avenue (near West 12th Street) brings you to a small but fascinating museum of Coney Island memorabilia. The view from the windows overlooks landmark rides like the Cyclone Rollercoaster, the Wonder Wheel and the Parachute Jump. The museum itself is full of antiques and fun relics of old rides. A visit is certainly worth the modest admission price of 99 cents. The museum is open on Saturdays and Sundays, year round, from noon to 5pm. Visiting hours may be expanded during the summer season. The Coney Island Museum is the only museum in the world dedicated to interpreting and preserving the history of Coney Island. Our collection is continually growing and a walk around the gallery will give you a sense of the importance of this place to the nation and the world. Thaddeus Rutkowski, Iris N. Schwartz, Alice B. Talkless and Sheryl Simler.